Lynn and Chuck found a 1957 Corvette travel trailer for us the other day, (more on that in a blog soon), and while cleaning it out today I ran across this. It seems to be from the Grand Hotel Cairo. I have no idea of how old it is. It appears to be a plaque that was nailed to something, maybe the door? Supposedly this trailer has made some adventures overseas. Could it really have made a trip through Egypt sometime in the last 54 or so years? If only it could talk. HI, I also have one of these small signs and have no idea about its history. The sign I have is exactly the same including the 4 x mounting holes. Please let me know if find any further information as I too am quite interested. I know it is years since this was posted, but I recently found one amongst my husbands/father-in-laws stored things. It is the same. Does any one know if it has value? It is quite unique and fun too. Carol. I did some research a while back and it looks like these were made as a novelty item. They weren’t actually used for anything. Wow! I can’t believe that others have this sign as well! My husband and I picked it up at a rummage sale on 3/12/11 in San Diego, Ca. It is mounted to a block of wood and looks exactly like yours. If you find anything out about it please pass on the info. What an interesting find! Omigosh. I went to a auction here in in St. Pete, FL last month. I bought a really nice frame and this same plaque was inside. I took it out, not sure what to do with it or what it means …. 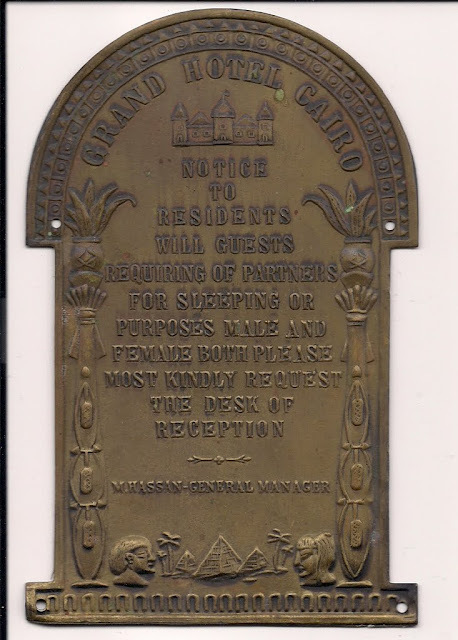 How old is the GRAND HOTEL CAIRO? I found this on eBay from the UK . . .
Today I found one in a charity shop near Brussels. The Grand Hotel in Caïro dates from 1939. Keep me informed. I found one in a friends pasture, here in Missouri, Not far from St. Louis. I was wondering if it is somehow from Cairo, IL. That is just down the Mississippi from us. I have one too! Here in Toronto, ON Canada. My mum apparently bought it down at the Tyneside market in Newcastle-upon-Tyne (in the UK) years ago. I have one too. I bought it in August 2018, in Bridport, Dorset, UK. I keep it in my box-of-curiosities. Fun item, even if made as a novelty item.